Welcome to Squamish! 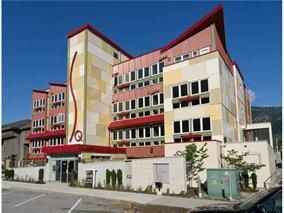 This very clean 1 bedroom apartment is located in downtown Squamish, in the heart of the areas exciting re-development. Close to shopping, the waterfront, Farmers market, the Spit (windsurfing/kiteboarding), the Chief and everything else beautiful Squamish has to offer. This well built 2011 building is still under warranty. This is a great opportunity to own a solid investment property, vacation home or primary residence in an upcoming area in the "Hot" Squamish market. For more information on Squamish or Whistler area homes contact Kyle at 778.847.3325 (kyle@kyleroman.com). Are you a buyer? Let our team help you find your next home. Contact Kyle (778.847.3325; kyle@kyleroman.com) for more information on living on the North Shore or Sea-to-Sky Corridor, or for an update on local market conditons.